I'm here at long last. Steinsetra. Before this moment just a place name and a winter parking symbol just north of lillehammer on the map but now reality. Cold, white, cloud covered reality. I say at long last not because the journey has been a long one, it’s now a little after two in the afternoon and the taxi ride the flight to Oslo followed by the drive up the E6 has taken a just nine hours or so. Nor do I say long last because of the mishaps along the way, ten minutes from home I’d had to turn back to get my forgotten passport waking up my ten month old son, and consequently the whole family, in the process and this is the second winter car park we’ve visited today. Rather it's because it seems an age since this trip was conceived. In reality only a few weeks have past since the decision was made to come, but what weeks! A family Christmas, work commitments and illness have transpired to stretch those six weeks out into what feels more like six months. All things considered I feel lucky to be here but the joy of the arrival and the anticipation of setting off are laced with trepidation. Although Oyer Fjellet, in the great scheme of things,and certainly as far as Norway is concerned, isn’t far from the populated world, it’s now deep winter and the plan is to sleep out on two of the three nights. I’ve cold camped in the UK many times but this will potentially break all my records. What's more I’m not a skier. I’ve skied lots of times, both downhill and cross country, but apart from a three or four year period many winters ago during which I was committed to improving my skills, my skiing trips are now punctuated by long periods of abstinence. Periods just long enough to forget the face plants and frustrations. Right now I’m wondering how I’m going to fair on Nordic skis with sixteen kilos of anti-balance strapped on my back. Any negative thoughts centred on hypothermic nights and broken limbs would be easy to suppress were it not for the fact that a week ago I’d been diagnosed as having pneumonia. It had taken two weeks of bed rest, several arguments with my GP and finally chest x-rays to confirm my initial self diagnosis. The right antibiotics work wonders and I’m now feeling good but I still can’t help but wonder how I’m going to manage. Long days of kick and glide and deep sub zero temperatures are going to demand a lot of my body and I’m aware that ski touring and winter camping are, at the least, unconventional measures to combat pneumonia. One more time I wonder if I should have stayed at home but a glance at my surroundings kills the thought. The pull is just too strong. As we make our final preparations I check that I’ve packed my pills three or four times. Fifteen minutes of faff and a two minute instruction on Rottefella cable bindings later and we’re strapping on skis and hoisting packs. The instruction, courtesy of Willem-Maarten, is necessary. 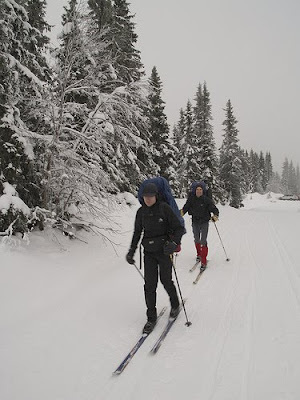 Experience within the group of four is varied, for three of us this is the first time on a heavy Nordic touring set up. For one of the four this is the first time on Nordic skis full stop. The planned route also reflects the groups experience. After much debate and many changes of tack we had finally arrived at a plan entailing a very modest first leg. This afternoon we will ski just a few kilometres along groomed trails, all uphill but on a gentle incline, to what looks like a good location to set up camp. We’re parked at around 800m elevation and will camp at 900m elevation just three or four kilometres from the start point. A gentle start to get accustomed to the skis under our feet and the weight on our backs whilst, crucially, leaving daylight and energy enough to set up camp. A short waddle sees me across the car park, over a steep drift and then into the tracks. Within a few strides the kick and glide of five years before comes back and I settle into a comfortable rhythm. It all feels more familiar than I’d expected despite the wider skis and heavier bindings. A good start. The extra effort of correcting for the to and fro momentum of a heavy pack is however new. I make an effort to put on some speed and open a gap between myself and the group then step out of the track and turn around to take in the scene and record it for posterity. All is well. The group are moving confidently and fluidly and all faces are dressed with a fat toothy grin that I’m sure will look good on the photos. Returning to the tracks I get moving again and follow the others up the gentle slope. As I put metres behind and beneath me I can feel the worry and uncertainty peeling away like the skin of an onion until all that’s left is the rhythm of my breathing, the beat of my blood, the track under my feet , the bighting cold on my face and my surroundings. I'm into it already. From here on in it’s going to be simple. All about movement, route finding and the next meal. That and staying upright. As we climb we gradually enter the cloud base. First a light, eerie mist hanging between the huts of Steinsetra, distilling the light, fractionating the colour until just the extremes of contrast are left. Then comes a thicker mist, one you can taste, and even the contrast is removed. Dimensions are lost. The world is a flat, grey-white without relief. Under different circumstances this would be difficult but right now were moving slowly uphill on a prepared track and we know exactly where we are. We pause several times to check the map nevertheless, getting a feeling for the scale and the detail and the licence of the cartographers hand but there’s never cause for concern. On one such stop it occurs to me that something strange has happened. Theo, usually happy to follow, is in the driving seat. Time flies when you're having fun. A glance at my watch tells me it's approaching four o'clock. We should be setting up camp whilst there's still enough light. I've hardly formulated the thought when Willem-Maarten voices the same opinion. We ski on for ten more minutes and as we approach the crest of the rise decide to back track a little way and head South from the track to find a suitable pitch. Our first foray off-track brings us through sparse woodland to the North-Western foot of Veslehaugen where, after just a couple of hundred meters of breaking trail, we find a sheltered clearing we assume is well out of site of the track. After a pause to don extra layers we get straight into the business of setting up tents. I'd assumed this would be done in no time. Although it's some time since my tent was used in anger I know it well and pitching is usually a couple of minutes work. Today is different. Today, if I remove my skis I'll sink up to my waist in the snow. Before we can do anything we have to prepare a consolidated platform. We start by stamping out a square with our skis. Theo, full of enthusiasm, then removes his skis but still sinks beyond his knees. He then takes the snow shovel and starts to dig. After half a minute he's standing in a hole half a meter deep and still throwing out pure powder. In the meantime I've discovered the shock-chord through the tent poles has slackened off to what seems to be twice it's normal length. As I, still strapped into my skis, make running repairs I suggest Theo might want to stop digging any time soon. I then start to thread the poles into the fly. An easy task when you're free to run around but today the mountain has to come to Mohamed. It takes me an age to set up the fly. I offer to give Theo, still digging an ever deeper hole, a break take off my skis and jump in. It occurs to me that rather than removing snow we need to be adding it. I start to work snow from the edge of the platform into the middle while Theo dances happily to and fro. It takes half an our of sustained activity before we've got a solid floor under a pitched tent and fifteen minutes more before I've got five good snow anchors set to hold the guys in place. Not good. Too long. We's clealry need more practice to cope with a forced pitch in bad weather. Still, it seems we've found a decent spot. The wind is light but what wind there is is effectively blocked by the trees. The temperature is bearable, I guess around -10ºC under the last of the sun and I'm warm enough in my down under a Gore-tex shell. 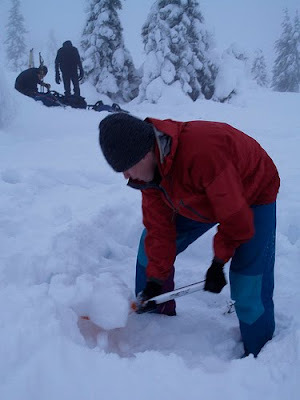 Willem-Maarten and Thim, a little quicker with their tent, have also started melting snow. Before long, the last of the daylight has faded, the first few litres of water are at a rolling boil and four freeze-dried meals, the first of many this weekend, are re-hydrating in cosies. Meals are consumed, under the light of head torches, without pause for breath and with little exchange of words. 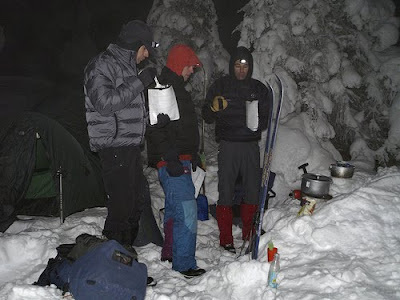 The remaining hot water decanted into thermos flasks we climb into tents and bed down for the night. I'm tired, it's pitch black and my body clock is telling me it's late, in any case definitely time for bed. As I busy myself setting up my bed I glance at my watch. It's seven o'clock. As I climb into my bag It occurs to me that Emily and Benjamin havn't even gone to bed yet. Wow, that was very brave of you to go so shortly after you had pneumonia. Glad everything went well. Setting up in winter is certainly different than in summer. With our group, on snowshoes, we just collectively trampled the pitching places flat, let it settle for a while, and then started pitching. Looking forward on how the story continues, your writing is superb as usually. Dave - fantastic! I had a similar problem last weekend. You spend ages tramping out a work-hardened area, step off the skis and promptly learn very quick lessons about weight and surface area! Getiing back onto skis that are now at hip height is even more fun! Hendrick, Thanks for the glowing compliment. I've had pneumonia three winters in a row. Enough to self diagnose and enough to know when I'm over the worst of it. I have a new doctor who was reluctant to go with my diagnosis and so treatment came late but I was pretty sure a week into the treatment that teh antibiotics had done their work. 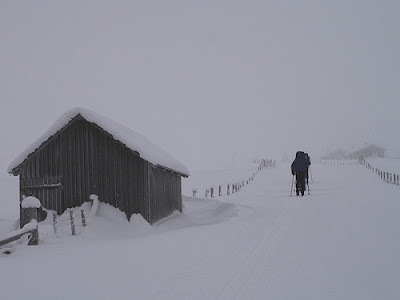 That, coupled with a reasonable forecast and the close proximity of a hut tipped the balance. It was a calculated risk and with hindsight a good call. A great read Dave. 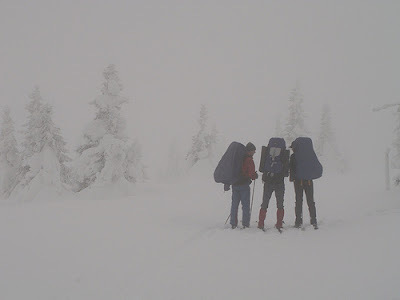 I have yet to camp in that sort of snow, looks like there is more to it than simply throwing up the tent! James, Thanks! Yes. This was my first time on anything too deep to get a peg into the ground. I'd read the theory but, as is often the case, the practice was a little different. After a bit of trial and error we managed to create a good firm platform and then it was buisness as usual. All in all it was a pleasant camp. 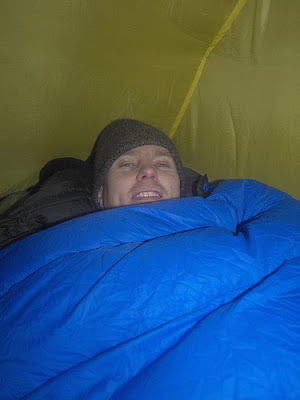 The cold was more managable than I'd anticipated and much of the same good camp practice applies.